Wedding A La Las Vegas Style! 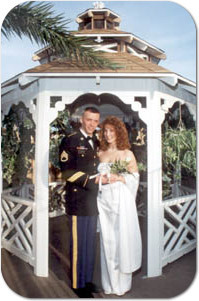 Military Service, Firemen and Police personnel, book your wedding with us and Viva Las Vegas Wedding Chapel will pay your Minister fee. It's our way of thanking all of you who serve our country with pride! Romance... Elegance... Beauty... and Excitement. Reflecting the feel of the Southwest, our wedding chapel looks like an adobe mission, complete with a bell tower. The rustic interior features wooden beams and a vaulted ceiling, pitched atop breathtaking stained glass windows. Quaint wooden benches, adorned with delicate white flowers, accommodate up to 100 guests, making this the largest wedding chapel in Las Vegas. The flooring is a gleaming Spanish tile, with soft green carpet leading down the aisle. And what an aisle it is! Gloriously long enough to show off the most elaborate bridal trains in our classic traditional wedding ceremonies. Most wedding packages include super stretch limousine service to and from your hotel, wedding flowers, photography and video of the ceremony. Our on-site florist can work with you to serve your special needs, and our caring staff can tailor your wedding to fit your dreams and your budget. Don't want to go to the trouble of packing a gown and tuxedo? A courtesy Limousine service can pick you up for same day fittings for the wedding gown or tuxedo of your dreams. You may choose our most popular Elvis Blue Hawaii wedding package, with Elvis performing the ceremony and singing his hit songs. This wedding ceremony is highlighted by a lush tropical set, hula girls dancing to Elvis' rendition of the Hawaiian Wedding Song, and theatrical fog and lighting effects. Your guests may even want to sport their best luau-wear. Or select instead an exotic Egyptian wedding, with King Tut as minister...or even go back to medieval times and be married by Merlin the Magician in our Camelot theme wedding. The choice is yours, and your options are nearly endless. Explore them all by clicking on your favorites! Viva Las Vegas Wedding Chapel was voted "The Best Wedding Chapel in Las Vegas" for the years 2000 and 2002 by the Las Vegas Review-Journal. We invite you to come see why! You may find yourself part of the many television shows which have featured our weddings: Recent visitors in December include; NBC Nightly News, The Tonight Show with Jay Leno, Christopher Lowell Show, Oprah, E Television, The Billboard Awards, VH1, MTV, The Travel Channel, NBC News, A&E, The Discovery Channel, The Learning Channel (TLC.com), The Fox Millennium Show, Time Magazine Millennium Edition and Katie Couric of The Today Show. Katie was so intrigued by the variety and style of our weddings that she sent a film crew to feature us on her show. Join all those celebrity couples who have tied the knot in one of the most romantic cities on the planet---Richard Gere, Bette Midler, James Caan, David Cassidy, Cindy Crawford, Dudley Moore, Paul Newman, Dennis Rodman....just to name a few. Best of all, your family and friends who can't be here in Las Vegas to witness your special day will now be able to watch your wedding online with our streaming live videos FREE via our Chapel Web Cams! Plus, we were voted one of the Top Ten Web Cams in the World by Earth Cam! Visit our Live Web Cams for more information. The Defense Commissary Agency operates nearly 280 commissaries worldwide, providing groceries to military personnel, retirees and their families. Authorized commissary patrons purchase items at cost plus a 5-percent surcharge, which covers costs of building new commissaries and modernizing existing ones. Shoppers save an average of more than 30 percent on their purchases compared to commercial prices – savings worth more than $2,400 annually for a family of four. A core military family support element and a valued part of military pay and benefits, commissaries contribute to family readiness, enhance the quality of life for America’s military and their families, and help recruit and retain the best and brightest men and women to serve their country.